The global expansion of the aquaculture industry has brought with it a corresponding increase of novel viruses infecting different aquatic organisms. These emerging viral pathogens have proved to be a challenge to the use of traditional cell-cultures and immunoassays for identification of new viruses especially in situations where the novel viruses are unculturable and no antibodies exist for their identification. Viral metagenomics has the potential to identify novel viruses without prior knowledge of their genomic sequence data and may provide a solution for the study of unculturable viruses. This review provides a synopsis on the contribution of viral metagenomics to the discovery of viruses infecting different aquatic organisms as well as its potential role in viral diagnostics. High throughput Next Generation sequencing (NGS) and library construction used in metagenomic projects have simplified the task of generating complete viral genomes unlike the challenge faced in traditional methods that use multiple primers targeted at different segments and VPs to generate the entire genome of a novel virus. In terms of diagnostics, studies carried out this far show that viral metagenomics has the potential to serve as a multifaceted tool able to study and identify etiological agents of single infections, co-infections, tissue tropism, profiling viral infections of different aquatic organisms, epidemiological monitoring of disease prevalence, evolutionary phylogenetic analyses, and the study of genomic diversity in quasispecies viruses. With sequencing technologies and bioinformatics analytical tools becoming cheaper and easier, we anticipate that metagenomics will soon become a routine tool for the discovery, study, and identification of novel pathogens including viruses to enable timely disease control for emerging diseases in aquaculture. Traditionally, the diagnosis of viral diseases has been dependent on cell culture in which viruses exhibit cytopathic effects (CPE) and immunoassays based on antibodies having the binding specificity for the virus to be diagnosed (Leland and Ginocchio, 2007) in addition to amplification of specific gene segments of the viruses by polymerase chain reaction (PCR). Virus propagation using cell-culture has significantly contributed to the development of protective vaccines against fish diseases such as infectious pancreatic necrosis virus (IPNV), viral hemorrhagic septicemia virus (VHSV), infectious hematopoietic necrosis virus (IHNV), salmonid alphavirus (SAV), and infectious salmon anemic virus (ISAV) in aquaculture (Sommerset et al., 2005; Gomez-Casado et al., 2011; Munang'andu et al., 2014a,b; Munang'andu and Evensen, 2015). However, the bulk of viruses found in aquatic environments are unculturable (Wang et al., 2002) and there are no antibodies available for their identification nor specific primers for PCR detection, which precludes their study. The detection of non-culturable viruses (Handelsman, 2004; Schloss and Handelsman, 2005), by molecular biology based tools such as the PCR test demand that the genomic sequence of the target virus be known prior to diagnosis (Yamaguchi et al., 2000; Bibby, 2013), which precludes the identification of novel viruses whose sequences are unknown (Gao and Moore, 1996). Given that aquaculture is continuously faced with the challenge of identifying novel pathogenic viruses infecting different fish, crustaceans, and shellfish species, there is an urgent need to develop diagnostic tools able to identify those viruses in order to expedite the process of developing timely disease control strategies. In the last decade, high throughput next generation sequencing (NGS), has emerged not only as a powerful tool able to enhance our understanding of the host response to infection (Xu et al., 2015, 2016a,b), but as a tool able to unravel a large number of viral genomes using metagenomics analysis (Handelsman, 2004; Riesenfeld et al., 2004). Viral metagenomics analysis is a culture independent approach that does not require prior knowledge of the genomic sequence of the virus to be identified (Handelsman et al., 1998; Streit and Schmitz, 2004; Gross et al., 2010; Mokili et al., 2012; Martínez-Porchas and Vargas-Albores, 2015). It provides a unique opportunity able to identify several viruses in one sample at the same time. The scope of its application in aquaculture is bound to expand from the analysis of environmental microbial composition to the search for novel viruses, routine diagnosis, disease surveillance, and public health. Given the increase of emerging pathogenic viruses in aquaculture, it is anticipated that viral metagenomics is bound to expedite the process of identifying novel viruses that infect different aquatic organisms before they cause disease outbreaks reaching epidemic proportions. The number of viral metagenomics studies has exponentially increased from <10 publications in 2002, when this technology was first discovered (Handelsman, 2004; Riesenfeld et al., 2004), to >300 publications by 2010 (Mokili et al., 2012). Although its application in environmental studies has been widely reviewed by different scientists (Fuhrman, 1999; Breitbart et al., 2002; Edwards and Rohwer, 2005), there are limited reviews on its application in the discovery of novel viruses in aquaculture. Hence, in this review we first provide a historical background of viral diseases discovered using the traditional cell culture, immunoassays, and basic PCR techniques in aquaculture. As a second step, we provide an overview of viral diseases discovered using viral metagenomics and NGS in order to compare the traditional approaches and viral metagenomics analysis in the discovery of novel viruses. In addition, we also highlight the diagnostic role and other potential uses of viral metagenomics apart from its use in the discovery of novel viruses. Based on observations herein, we advocate that scientists faced with the challenge of identifying new viruses infecting aquatic organisms should explore its application in order to expedite the process of developing timely disease control strategies for emerging viral diseases for aquatic organisms. The major viral diseases of aquatic organisms can be divided into viruses of finfish, crustaceans, and marine mammals as shown below. The major challenge in the control of viral diseases in aquaculture is the long duration it takes from the first time the disease is discovered through clinical reports to identification of the etiological agent. This delay precludes our ability to develop timely disease control strategies. For example, IPNV was first reported as a clinical disease causing acute catarrhal enteritis in salmonids in 1940 (McGonigle, 1941) and yet the virus was first identified and characterized 20 years later in 1960 (Wolf et al., 1960). VHSV was first identified in 1962 (Jensen, 1965) followed by IHNV in 1969 (Wingfield et al., 1969) although reports of mortalities caused by both viruses date far back in the early 1950s. In the case of nodavirus, infections causing major problems in hatcheries as well as clinical signs linked to lethargy, anorexia, pale coloration and corkscrew swimming in barramundi (Lates calcarifer) and other fish species in Asia were first reported in the 1970s and yet the virus was first characterized in 1990 (Glazebrook et al., 1990; Munday et al., 2002). SAV was first reported as a disease causing skeletal muscle and cardiac myopathy in salmonids in 1976 and yet the virus was first identified and characterized almost two decades later in 1995 (Boucher et al., 1994; Castric et al., 1997). Outbreaks of cardiomyopathy syndrome (CMS) were first reported in 1985 (Amin and Trasti, 1988) while the virus responsible for the disease was recently characterized as piscine myocarditis syndrome virus (PMCV) in 2011 (Haugland et al., 2011). Similarly, heart and skeletal muscle inflammation (HSMI) outbreaks were first reported in 1999 (Kongtorp et al., 2004a,b) and yet the etiological agent was recently identified after a decade as piscine reovirus (PRV) now referred to as piscint orthoreovirus (Løvoll et al., 2010; Palacios et al., 2010). Table 1 shows a summary of the major fish viral diseases showing the year when clinical cases were first reported and the year when the etiological agent was identified. The general trend is that etiological agents were only identified after they caused disease outbreaks reaching epidemics proportions, which is in line with observations made by Alavandi and Poornima (2012) who pointed out that our response to viral infection has mainly been reactive in the sense that a new pathogen is usually not identified until it has reached epidemic proportions. Hence, there is need to develop proactive diagnostic tools able to identify novel viruses before they cause disease outbreaks leading to high economic losses in aquaculture. Table 1. Viruses infecting finfish discovered using traditional cell culture methods. Apart from fish farming, shrimp farming is one of the rapidly expanding aquaculture industries whose expansion has brought with it a corresponding increase in the number of novel pathogenic viruses being discovered. Similar to observations in fish, Table 2 shows that the year when the first clinical case was identified in shrimp and the year when the etiological agent was identified, depicting long intervals allowing the diseases to reach epidemic levels before the causative agents were identified. For example, mortality due to Taura syndrome (TS) reached high epidemic proportions spreading from the Taura river in Ecuador, where the disease was first reported (Jimenez, 1992), expanding to Peru, Colombia, Brazil, Honduras, and Hawaii. It spread to Asia where it infected different shrimp species before the virus was identified (Walker and Winton, 2010). The cause was initially attributed to fungicide toxicity (Lightner et al., 1994) and the subsequent identification of Taura syndrome virus (TSV) as the etiological agent of the disease led to development of molecular diagnostic tools that paved way to breeding and cultivation of specific pathogen free (SPF) stocks to ensure that all stocks used in shrimp farming were free of the disease (OIE, 2016). Similarly, white spot syndrome virus (WSSV), shrimp infectious myonecrosis virus (IMNV), Penaeus vannamei nodavirus (PvNV) and several other shrimp viral diseases reached high epidemic levels before their etiological agents were identified and characterized (Lotz, 1997; Arcier et al., 1999; Tang and Lightner, 1999; Yang et al., 2001; van Hulten et al., 2001). Identification of the causative agents for these diseases paved way to developing diagnostic tools that are currently used for the screening of breeding stocks to ensure that only SPF stocks are used for shrimp production (Lotz, 1997; Arcier et al., 1999; Tang and Lightner, 1999; van Hulten et al., 2001; Yang et al., 2001; OIE, 2016). Hence, it is important that proactive diagnostic tools able to timely identify novel pathogenic viruses are devised in order to expedite the process of developing effective disease control strategies against emerging viral disease in aquaculture. Table 2. Shrimp viruses discovered using traditional cell culture methods. Although calicivirus infections date as far back as 1932 when pigs that were fed raw garbage in Los Angeles in California resulted in an outbreak that caused high mortality in the infected pigs, the disease in marine mammals was first reported in 1972 from rectal swabs of Californian sea lions (Zalophus californianus) that had just aborted on San Miguel Island (Smith and Boyt, 1990). The causative agent was characterized and named San Miguel sea lion virus type I (SMSV-1). When SMSV-1 was administered in pigs, it caused classical vesicular exanthema syndrome in pigs comparable to the 1932 outbreak (Smith et al., 1973, 1998; Smith and Boyt, 1990). By 1982, calicivirus virus infections had been isolated from 11 pinnipeds and cetaceans and the host range of infected species has continued to increase (Smith et al., 1998). Marine mammal morbilliviruses were first discovered in late 1980s following a large outbreak in which approximately 18,000 harbor seals and gray seals were found dead on Northern European coasts in 1987–1988. The etiological agent was classified as phocine distemper virus (PDV). Similar high mortalities involving thousands of animals were reported in subsequent years in different species including porpoises (Phocoena phocoena) (Kennedy et al., 1988), Phoca caspisa (Kennedy et al., 2000; Ohashi et al., 2001; Kuiken et al., 2006), Stenella coeruleoalba (Domingo et al., 1990), Tursiops truncates (Lipscomb et al., 1994a,b), and Phoca vitulina (de Swart et al., 1996), harp seals (Phoca groenlandica) (Markussen and Have, 1992). The first report of influenza virus infections in marine mammals was in 1979 when more >500 harbor seals were found dead on the North Eastern Coast of the USA due to H7N7 subtype infections (Lang et al., 1981; Webster et al., 1981b). In 1982–1983, an outbreak of influenza due to subtype H4N5 caused mortality in more than 60 harbor seals in Massachusetts coastal areas in the USA (Hinshaw et al., 1984). Since then, influenza A and B viruses have been isolated from different cetaceans and pinnipeds of which postmortem handing has been linked to zoonotic infections in humans (Webster et al., 1981a,b; Hinshaw et al., 1984, 1986). The earliest reports of adenovirus infections in marine mammals were in the late 1970s in large numbers of sea lions that had clinical signs of hepatitis and enteritis (Britt et al., 1979; Dierauf et al., 1981; Goldstein et al., 2011). Since then, adenoviruses have been isolated from California sea lions, South African fur seals (Arctocephalus pusillus), South American sea lions (Otaria flavescens) (Inoshima et al., 2013), sei whales (Balaenoptera borealis) (Inoshima et al., 2013), bowhead whales (Balaena mysticetus) (Smith et al., 1987; Inoshima et al., 2013), beluga whale (Delphinapterus leucas), and bottlenose dolphins (T. truncates) (Rubio-Guerri et al., 2015). The first report of marine mammal herpesvirus infection was from an outbreak of several harbor seals that had acute pneumonia and hepatitis in the Netherland in 1985 (Osterhaus et al., 1985). Thereafter, herpesviruses have been isolated from several species including harbor seal (P. vitulina) (Borst et al., 1986), bottlenose dolphin (Tursiops truncatus) (Manire et al., 2006; van Elk et al., 2009), orca (Orcinus orca) (Maness et al., 2011), California sea lion (King et al., 2002; Buckles et al., 2006), and gray seals (Halichoerus grypus) (Harder et al., 1996). Other viruses shown to infect marine mammals include poxviruses that have been reported in cetaceans and pinnipeds of which some are zoonotic (Van Bressem et al., 1993; Bracht et al., 2006; Waltzek et al., 2012) and astroviruses that have been associated with diarrhea in California sea lions, Steller sea lion (Eumetopias jubatus) and bottlenose dolphin (Rivera et al., 2010). Put together, these studies further consolidate the notion that our response to viral infections in aquatic organisms has mainly been reactive given that the causative agents for these diseases were only identified after they caused massive outbreaks reaching epidemic proportions. Hence, there is need for proactive diagnostic tools for the timely identification of novel pathogens having the potential to cause disease outbreaks in order to help design effective disease control strategies. Viral metagenomics has led to discovery of several new viruses in different aquatic organisms including fish, crustaceans, molluscs, turtles, and marine mammals as shown below. Recently identified pathogenic viruses of fish include the circovirus isolated from barbell fish (Barbus barbus), which causes mortality within 4–6 days after hatching (Lőrincz et al., 2011). Phylogenetic analysis of two complete genomes classified as Barbell circovirus 1 and 2, (BaCV1 and BaCV2) showed that these viruses belong to two new genetic groups within the Circoviridae family, which are distinct from previously known circoviruses (Lőrincz et al., 2011). Apart from barbell fish, circoviruses have been detected in common bream (Abramis brama), asp (Aspius aspius), round goby (Neogobius melanostomus), monkey goby (Neogobius fluviatilis), and roach (Rutilus rutilus) (Tarján et al., 2014). Novel circoviruses have also been identified from the European catfish (Silurus glanis) (Lőrincz et al., 2012) and European eel (Anguilla anguilla) showing clinical signs of a cauliflower-like disease (Fichtner et al., 2013). Reuter et al. (2015) identified a novel posavirus designated as Fisavirus 1 (FisaV1) from freshwater carp (Cyprinus carpio) and a novel seadornavirus resembling the mammalian Banna virus from freshwater carp (Reuter et al., 2013). In another study, Boros et al. (2011) identified a novel (+)ssRNA virus with a di-cistronic genome in carp while Mor and Phelps (Mor and Phelps, 2016b) identified a novel totivirus from Gold shiner (Notemigonus crysoleucas) baitfish using NGS. The majority of viruses shown in Table 3 have only been discovered in the last 4 years unlike viruses in Table 1, which took long to discover using traditional methods. Hence, the rate at which viruses in Table 1 were discovered compared to viruses in Table 3 supports our notion that NGS and viral metagenomics are proactive diagnostic methods that have significantly accelerated our ability to identify novel viruses of fish. Table 3. Fish and shellfish viruses discovered using NSG and Metagenomics analysis. Ng et al. (2013) identified two nodaviruses from the pink shrimp (Frafantepenaeus duorarum hepatopancreas), which is a commercially important farmed shrimp species. One virus clone had a 403 nt insert encoding the RNA-dependent-RNA polymerase (RdRp) partial sequence while the other contained a 236 nt insert encoding a capsid protein partial sequence. Phylogenetic analysis showed that the capsid sequence was 43–51% similar to the shrimp nodaviruses, Macrobrachium rosenbergii nodavirus (MrNV) and P. vannamei nodavirus (PvNV), which causes white tail disease in prawns (M. rosenbergii), and muscle necrosis disease in shrimp (Litopenaeus vannamei) (Table 2). Apart from FdNV, Ng et al. (2013) also identified the shrimp hepatopancreas associated circular virus (ShrimpCDV) from the digestive tract of the pink shrimp. Based on these findings, it can be concluded that viral metagenomics can be used to identify novel viral pathogens of shrimps. Once the genomic sequence of the novel virus has been determined, specific molecular biology diagnostic tools such as PCR can be designed and used for the screening of brood stock in order to ensure that only SPF stocks are used for shrimp production. In this way viral metagenomics is expected to play an important role in developing effective disease control strategies for novel viral infections of crustaceans before they cause devastating economic losses in aquaculture. Apart from fish and crustaceans, the farming of different species of mollusks, turtle, and starfish has also increased tremendously in the last few decades. Interestingly, novel viruses for these aquatic organisms have also been identified using viral metagenomics (Table 3). Ng et al. (2009a) identified a novel sea turtle tornovirus 1 (STTV1) as the cause of fibropapilloma tumors in Florida sea green turtles. Hewson et al. (2014) identified a novel Forbes sea star (Asterias forbes) virus (AFSSV) as the causative agent of a wasting disease condition linked to high mortality in the Forbes sea stars. On the other hand, Andrade et al. (2015) showed that oysters are the hotspots for Mimivirus isolations which are the largest viruses found in the world with >1,100,000 bp length. Overall, these findings show that viral metagenomics analysis is a powerful tool able to identify novel pathogenic viruses infecting different aquatic organisms. Captive marine mammals such as the Californian sea lions (Z. californianus) and bottle-nose dolphins (Tursiops tuncatus) are widely used as recreation animals. And as such, these animals are kept in marine parks where they are used in circus shows and other activities because of their intelligence and easy trainability. Given their close contact with humans, it has become expedient that their disease profile is determined both for public health reasons and for the sake of providing timely healthcare when they become infected with different diseases. Recently, Ng et al. (2009b) used viral metagenomics analysis to identify a novel California sea lion anellovirus (ZcAV) having 35% amino acid homology in the open reading frame (ORF) 1 with the feline anellovirus. In another study, Ng et al. (2011) used metagenomics analysis to identify a novel seal anellovirus (SealAV) in Pacific harbor seals (Phoca vitulina richardsii). Kluge et al. (2016) carried out a viral metagenomics survey from feces of subantarctic fur seals (Arctocephalus tropicalis) and South America fur seal (Arctocephalus australis). From the South America fur seals they identified seal anellovirus 5 (SaV5), and Troque teno salophus virus 1 (TTZV) while in the Subantarctic seal fur picornaviruses were identified namely Fur seal sakobuvirus (FSSV) having 50% amino acid identity resemblance to the Feline sakobuvirus A (FSVA). In addition, rotaviruses were identified from the subantarctic fur seals with 45–69% amino acid homology with group C rotaviruses. The identification of rotaviruses from Fur seals has important public health implications given that these animals are commonly found on coastal areas of South America where they attract a lot of tourism where they could serve as a source of zoonotic infections to tourists. These findings suggest that viral metagenomics can be used to obtain disease profiles for aquatic animals as well as profiles of zoonotic pathogens found in marine mammals. Table 4 shows some of the aquatic mammalian viruses discovered using viral metagenomics and NGS. 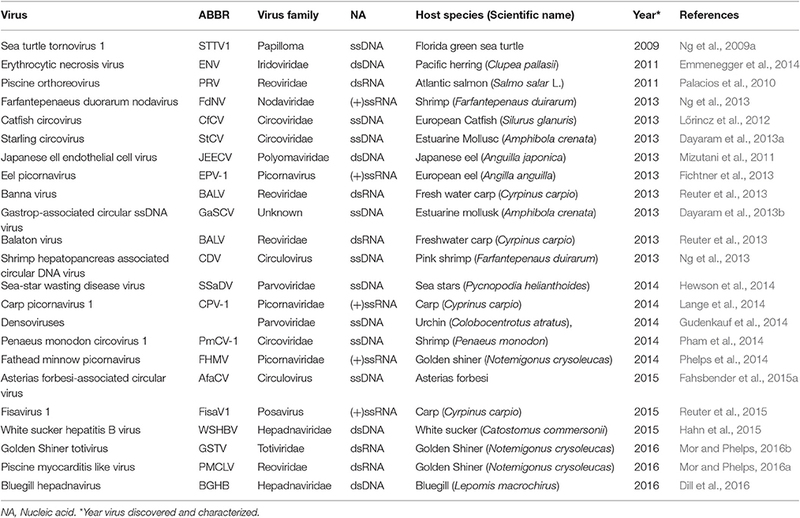 It is interesting to note that most of the viruses shown in Table 3 have only been discovered in the last 4 years further consolidating the notion that viral metagenomics is accelerating our ability to identify novel viruses infecting aquatic organisms. Table 4. Marine mammalian viruses discovered using NSG and Metagenomics analysis. Viral metagenomics have been used to directly identify novel etiological agents from tissues of diseased animals showing pathological changes (Finkbeiner et al., 2008; Yongfeng et al., 2011). Ng et al. (2009a,b, 2013) used lung tissues to identify the ZcAV infecting Sea lions in two separate mortality events. They (Ng et al., 2009b) showed that ZcAV was mainly found in the lungs and pleural-cavity and not in blood, tonsils, lymph nodes, liver, and other organs suggesting that metagenomics can be used to determine tissue tropism of novel viruses in hosts. Follow-up studies showed that the prevalence was high during outbreaks in captive sea lions (100%) and low in reservoir wild sea lions (11%) indicating viral metagenomics can be used to monitor the prevalence of the virus in marine animals. In follow-up studies, the virus from Sea lion was used to develop an enzyme linked immunosorbent assay (ELISA) and specific PCR (Fahsbender et al., 2015b). Apart from ZcAV, Ng et al. (2011) used infected lung tissues of Pacific harbor seals (P. vitulina richardsii) to identify SealAV. Hewson et al. (2014) used viral metagenomics to identify the Sea star-associated densovirus (SSaDV) as the causative agent of a wasting disease characterized by behavioral changes, lesions on the limbs, loss of tugor and death due to rapid degradation in infected sea-star (asteroid). They observed that increase in viral titers correlated with increase in pathology in the infected sea stars. Ng et al. (2009a) used tumors to identify STTV1 as the causative agent of fibropappillomas in Florida green sea turtles. Bodewes et al. (2015) identified Phocine herpesvirus 7 (PhHV-7) as the etiological agent of ulcerative gingivitis in phocines (Bodewes et al., 2015) while Enhydralutis papilloma virus 1 (EIPV-1) was shown to be the etiological agent of oral tumors diagnosed in Southern otters (Enhydra lutris Nereis) (Ng et al., 2015). Yang et al. (2011) have pointed out that viral metagenomics has a high chance of identifying co-infections than traditional diagnostic methods. Ng et al. (2009a) showed that STTV1 existed as a co-infection of a quasispecies of variant strains from a single fibropappilloma tumor in each infected turtle. The STTV1 variants detected by viral metagenomics were identical from the majority part of the viral genome while hypervariable regions (HVRs) were extensively divergent. Based on these findings, it can be concluded that viral metagenomics does not only serve as a diagnostic tool for identifying novel viruses, but it serves as a reliable tool for identifying co-infections of different viruses working together to cause disease as well as identification of co-infections of variant strains of the same virus existing as a quasi-species in a single infection. In this review, we have shown that viral metagenomics is a proactive diagnostic tool able to enhance the discovery of novel pathogenic viruses in aquaculture. In terms of the discovery of novel viruses, the de novo assemblies coupled with bioinformatics annotation tools used in viral metagenomics have simplified the task of identifying different sequence segments and variable proteins (VP) that constitute the assemblage of complete viral genomes. As for viral diagnostics, it can be used to identify etiological agents of single infections, co-infections, and tissue tropism. It can also be used for disease surveillance by profiling viruses infecting in different host species and determining disease prevalence in selected host species. As for quasispecies analyses, metagenomics analysis can help identify segments of the viral genome prone to genetic diversity and the conserved segments. Hence, viral metagenomics can be used as multifaceted tool for the identification of novel viruses, phylogenetic analyses, diagnosis of single and co-infection, tissue tropism, and disease surveillance. Moreover, it has been shown that metagenomics analyses can be used to study the epidemiology of viruses outside their susceptible hosts using environmental samples (Munang'andu, 2016). Despite so, viral metagenomics has some limitations that require the support of traditional diagnostic methods. For example, novel viral pathogens identified using viral metagenomics require verification, which calls for isolation of the etiological agent using cell culture, followed by virus characterization and infecting of susceptible hosts to show that the isolated virus is the causative agent of the identified disease by fulfilling the Koch's postulates (Rivers, 1937). And as pointed out by different scientists that the bulk of viruses generated by metagenomics are unculturable (Handelsman, 2004; Schloss and Handelsman, 2005), verification can be a difficult challenge in situation where virus isolation and characterization tools are not available. Although PCR has also been used for verification, Yang et al. (2011) showed lack of correlation of between viral metagenomics and PCR data in their studies, which they attributed to possible errors in annotation, errors de novo assembly, sequencing biases and low sequencing depth. These observations further consolidate the notion that verification of viral metagenomics data can be a difficult challenge. Another important challenge faced in viral metagenomics analysis is that a large proportion of viral sequences generated using this tool remain uncharacterized mainly because they have no similarity with any known sequences in common databanks. Rosario et al. (2009) generated 70% unknown DNA viral sequences from reclaimed water while Zhang et al. (2006) produced 91% unknown viral sequences from human feces. In another study, Breitbart et al. (2002) generated 65% unknown viral sequences from seawater while Rosario et al. (2009) produced 57% unknown RNA viral sequences from reclaimed water. And as pointed out by Mokili et al. (2012), there is a general lack of appropriate bioinformatics tools for the characterization of unknown viral sequences this far. Li et al. (2016), pointed out that one of the problems associated with de novo assembly of viral sequences is that they sometimes form chimeric contigs made of artificially combined reads that are not easy to identify. Hence, the bulk of uncharacterized viral sequences, sometimes referred to as the “dark matter of metagenomics,” limits our ability to identify novel pathogens using this tool given that new viruses without homologous sequences in public databases are likely not to be identified. Kim and Bae (2011) compared the linker amplified shotgut library (LASL) with the multiple displacement amplification (MDA) methods and showed that there were more dsDNA viruses amplified from the LASL than the MDA library. On the contrary, the MDA library had more ssDNA viruses than dsDNA viruses from the sample, which is in line with observations made by Roux et al. (2016) who also showed that the choice of amplification method has a bias on ssDNA and dsDNA viruses detected from the same sample. Wommack et al. (2008) showed that short reads (<400 bp) tend to miss distant sequences in phylogenetic classification and that they are prone to miss BLAST homologs found in long reads, indicating that the length of the reads matter thereby posing a challenge in the choice of tools required for de novo assembly to ensure that only long reads are produced for easy of taxonomical classification of viruses. All authors listed participated have made substantial, direct and intellectual contribution and approved publication of the manuscript. This study was supported in part by the TRAHESA project, which is the Capacity building for training and research in aquatic and environmental health in Eastern and Southern Africa, funded by the Norwegian Development Agency, Project No. TAN/13/0027. Amin, A., and Trasti, J. (1988). Endomyocarditis in Atlantic salmon in Norwegian seafarms. Bull. Eur. Assoc. Fish Pathol. 8, 70–71. Boucher, P., Castric, J., and Laurencin, F. B. (1994). Observation of virus-like particles in rainbow trout Oncorhynchus mykiss infected with sleeping disease virulent material. Bull. Eur. Assoc. Fish Pathol. 14, 215–216. Britt, J. O. Jr., Nagy, A. Z., and Howard, E. B. (1979). Acute viral hepatitis in California sea lions. J. Am. Vet. Med. Assoc. 175:921. Brock, J., Lightner, D., and Bell, T. (1983). “A review of four virus (BP, MBV, BMN and IHHNV) diseases of penaeid shrimp with particular reference to clinical significance, diagnosis and control in shrimp aquaculture,” in Proceedings of the 71st International. Council for the Exploration of the Sea, CM (Geneva), 1–18. Castric, J., Baudin Laurencin, F., Bremont, M., Jeffroy, J., Ven, A., and l., Bearzotti, M. (1997). Isolation of the virus responsible for sleeping disease in experimentally infected rainbow trout (Oncorhynchus mykiss). Bull. Eur. Assoc. Fish Pathol. 17, 27–30. Dierauf, L., Lowenstine, L. J., and Jerome, C. (1981). Viral hepatitis (adenovirus) in a California sea lion. J. Am. Vet. Med. Assoc. 179, 1194–1197. Hinshaw, V. S., Bean, W. J., Geraci, J., Fiorelli, P., Early, G., and Webster, R. G. (1986). Characterization of two influenza A viruses from a pilot whale. J. Virol. 58, 655–656. Hinshaw, V. S., Bean, W. J., Webster, R. G., Rehg, J. E., Fiorelli, P., Early, G., et al. (1984). Are seals frequently infected with avian influenza viruses? J. Virol. 51, 863–865. Jensen, M. H. (1965). Research on the virus of egtvet disease. Ann. N. Y. Acad. Sci. 126:7. Jimenez, R. (1992). “Syndrome de taura (Resumen),” in Acuacultura del Ecuador (Guayaquil: Camara Nacional de Acuacultura), 17. Lightner, D. V., Jones, L. S., and Ware, G. W. (1994). Proceedings of Taura Syndrome Workshop: Executive Summary; Submitted Reports, and Transcribed Notes (Tucson, AZ: University of Arizona). Lightner, D. V., Pantoja, C. R., Poulos, B. T., Tang, K. F. J., Redman, R. M., Andreas, T., et al. (2004). “Infectious myonecrosis (IMN): a new virus disease of Litopenaeus vannamei,” in Book of Abstracts. World Aquaculture 2004, Honolulu, HI; Baton Rouge, LA: World Aquaculture Society. Limsuwan, C. (1991). Handbook for Cultivation of Black Tiger Prawns. Bangkok: Tansetakit Co. Ltd.
MacKinnon, M. (1987). “Rearing and growth of larval and juvenile barramundi (Lates calcarifer)” in Queensland Management of Wild and Cultured Bass/Barramundi, 148–153. McGonigle, R. (1941). Acute catarrhal enteritis of salmonid fingerlings. Trans. Am. Fish. Soc. 70, 7. Mjaaland, S., Rimstad, E., Falk, K., and Dannevig, B. H. (1997). Genomic characterization of the virus causing infectious salmon anemia in Atlantic salmon (Salmo salar L.): an orthomyxo-like virus in a teleost. J. Virol. 71, 7681–7686. Munro, A., Ellis, A., McVicar, A., McLay, H. A., and Needham, E. (1984). An exocrine pancreas disease of farmed Atlantic salmon in Scotland. Helgolander Meeresuntersuchungen 37, 571–586. Nunes, A. J., Martins, P. C. C., and Gesteira, T. C. V. (2004). Carcinicultura ameaçada. Rev. Panoram. Aquic. 83, 37–51. Office International des Epizooties (OIE) (2016). Taura syndrome. Manual of Diagnostic Tests for Aquatic Animals (Paris), 18. Rivers, T. M. (1937). Viruses and Koch's postulates. J. Bacteriol. 33:1. Rucker, R., Whipple, W., Parvin, J., and Evans, C. (1953). A contagious disease of salmon possibly of virus origin. US Fish Wildl. Serv. Fish Bull. 54, 174–175. Smith, A. W., Akers, T. G., Madin, S. H., and Vedros, N. A. (1973). San Miguel sea lion virus isolation, preliminary characterization and relationship to vesicular exanthema of swine virus. Nature 244, 108–110. Smith, A. W., and Boyt, P. M. (1990). Caliciviruses of ocean origin: a review. J. Zoo Wildlife Med. 21, 3–23. Thorud, K., and Djupvik, H. (1988). Infectious anaemia in Atlantic salmon (Salmo salar L.). Bull. Eur. Assoc. Fish Pathol. 8, 109–111. Copyright © 2017 Munang'andu, Mugimba, Byarugaba, Mutoloki and Evensen. This is an open-access article distributed under the terms of the Creative Commons Attribution License (CC BY). The use, distribution or reproduction in other forums is permitted, provided the original author(s) or licensor are credited and that the original publication in this journal is cited, in accordance with accepted academic practice. No use, distribution or reproduction is permitted which does not comply with these terms.